I try to find only the finest woods available for the instruments I make. When I found a wood supplier near my home city who showed me some Curly Maple logs that he had milled which had the incredible “flame” that fine Curly Maple is known for, I purchased a number of them. The wood had been kiln-dried to about a 10% moisture content. Wood has to be dry – meaning 10% moisture content or below – before I will even begin to make an instrument from the piece. This is to be certain that the wood will not be drying or changing shape and size during the process of construction. 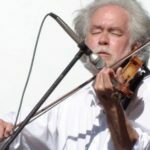 This is particularly important in the area of the neck of the instrument, as any change in the wood affects the fit of the fingerboard and the clearance of the strings over the fingerboard. Some woods are dried to a 5% moisture content, though they take on the moisture content of the environment, which in the Willamette Valley means roughly a 12% moisture content. The instruments that I’ve made are all solid-body instruments. The initial size of the wood that I need for the solid-body instrument shown below is a piece 25 – 30 inches long, 3 inches wide and 3 inches thick. Many suppliers of wood for musical instruments cut their wood at 8/4, meaning ~ 2 inches thick. It has taken me a while to find suppliers of excellent woods who can and will supply the dimensions I require, and at times, the “right” piece must be found, dried and shipped before it is ready to use. This instrument was made in 2002, and stained a deep gold. I used traditional Boxwood pegs as I felt they complimented the gold color and the intense “flame” of the wood. 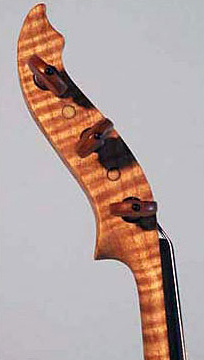 Frequently, Curly Maple of this type and quality is “quarter-sawn” , then the piece is split to form two “book-matched” pieces for use in the making of the backs of acoustic violins. 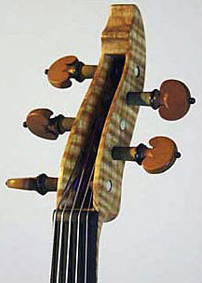 In the case of acoustic instruments, the wood used is air-dried, rather than kiln-dried. Wood air-dries slowly: 1 year for each inch of the thickness of the wood.